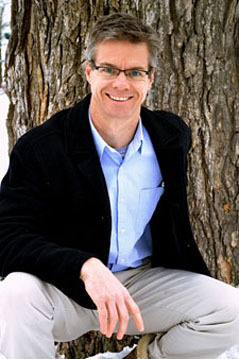 Professor Logan arrived at Bowdoin from the University of Colorado - Boulder in 1998 and has since had various roles at the College. In addition to being a professor, he has served as the Director of the Biochemistry program, Associate Dean for Academic Affairs, and assumed the role of Biology Department Chair in 2017. He is a plant physiological ecologist examining plant responses to environmental stress, with particular interest in photosynthesis and physiological mechanisms that protect leaves from excess light damage. He studies host-parasite interactions, acclimation to winter in evergreens, and global climate change. The ecophysiology of eastern dwarf mistletoe infection - Eastern dwarf mistletoe, a diminutive parasitic plant, can fell a mature white spruce in a matter of years. Curiously, a closely related host growing in the same forest stands, red spruce, tolerates infection and even succeeds in killing the parasite. 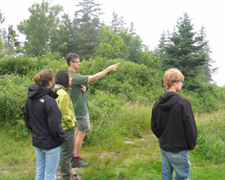 Students, collaborators and I seek to determine the causal chain of events leading to white spruce mortality and contrast it against the mechanism of red spruce tolerance, drawing upon observations at scales from gene expression and hormone metabolism through whole–tree growth and stand dynamics. The host-parasite interactions we study are shaped by 19th century removal of red spruce/fir-dominated forests to create pastureland that was subsequently abandoned and recolonized by white spruce. We conduct this work at several sites along the Maine coast, including Monhegan Island. The photoprotective role of anthocyanins - Anthocyanins, pigments responsible for the color of many red and purple plant organs (e.g., maple leaves in autumn) often accumulate in the upper layers of photosynthetic tissues during exposure to environmental stress and during juvenile and senescent stages of development. Using a combination of model systems (e.g., red- and green-leafed varieties of Coleus) and native plants (e.g., elderberry fruit-bearing stalks [peduncles]), students, collaborators at Victoria University of Wellington and I examine the hypothesis that anthocyanins screen light that would otherwise harm photosynthetic cells below. Jaret Reblin, Laboratory Instructor in Biology, is a close collaborator on many aspects of these and other projects. Bowdoin undergraduates are involved in nearly all aspects of my research. Many complete year-long independent projects for graduation with honors in Biology or Biochemistry. Others pursue lab or field research full-time in the summer with the support of fellowships (see the Biology Department and Student Fellowships and Research websites for more information). From my lab to date, 25 Bowdoin students have co-authored publications in peer-reviewed scientific journals (five of those students were first authors). Charlotte Nash, 2018/2019 Impacts of tidal restrictions on carbon sequestration in Maine tidal marshes. Trevor Kenkel, 2016/2019 Photosynthetic responses of aquaponics-grown leafy crops to measurement conditions. Hanna Baldecchi*, 2017/2018 The impact of eastern dwarf mistletoe on red spruce vs. white spruce tree vigor. Nora Hefner, 2016 Photosynthetic responses of different accessions of Brachypodium sylvaticum exposed to water stress. Benjamin West*, 2015/2016 Examining functional roles for anthocyanins in plant leaves. Sara Hamilton, 2015 Photosynthetic responses of different accessions of Brachypodium sylvaticum. Michael Walsh*, 2013/2014 Functional implications of the reddening of the fruit-bearing stalks (peduncles) of elderberry (Sambucus sp.). John de Villier*, 2013/2014 Progressive effects of eastern dwarf mistletoe (Arceuthobium pusillum) parasitism on white spruce (Picea glauca) physiology (co-advised with Jaret Reblin).